Completing your diagram drawing is not the end of surprise in Edraw. You will experience more surprises by flexibly exporting them to diversified formats. 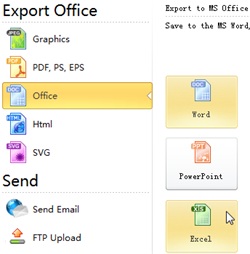 Overall, when you export to excel or PowerPoint, both formats of exported files can be edited no matter what version of Office you have. Learn more about export here for maximum effect of your drawings. You can export Edraw diagrams to various graphic formats, including PNG, BMP, JPEG, GIF, WMF and EMF. If you need transparent images, please export your drawing to PNG format. 6. Choose the format you need from the drop down menu of Save as Type. Edraw is completely compatible with Office. 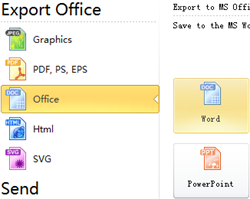 If you have installed the Word 2010 Word 2013, you can export Edraw to editable Word documents. If you only have older version of Word, we suggest you to export Edraw to graphic format firstly and then insert the graphics into Word. In other words, you can save an Edraw diagram as .docx format. Alternatively, you can export specific shapes to your Word file, which is useful if you want to display detailed aspects of a diagram. 1. Double click the diagram from which you want to export shapes. 2. 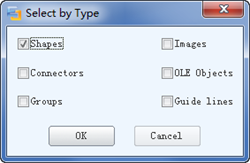 Click the drop down menu of Select tool, choose Select by Type. 3. Choose Shapes type. Click OK.
4. Drag the mouse to select the shapes you want to export. 5. Go to the Edit menu and select Copy or press Ctrl + C.
6. Open the document into which you want to insert shapes. 7. Click the Paste drop-down button in the Clipboard group of the Home tab or press Ctrl + V.
Note: If you want to copy and paste the entire graphic, in step 2, choose Select All. 1. Double click the file to which you want to insert picture. 3. Choose Picture in the Insert picture group. 4. Locate the diagram you want to add. 2. Hit Export & Send. 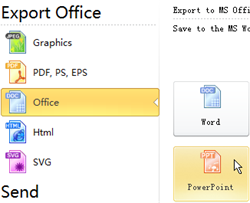 Note: The way to transfer shapes to PowerPoint slide is similar to transferring shapes to Word. 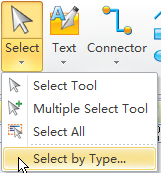 Note: The way to transfer specific shapes to Excel is similar to transferring shapes to Word. Editable PDF files are more advantageous than general PDF files because they are editable, highly clear and small in size. In Edraw, it is quite easy to gain this format of file. 3. Click "PDF, PS, EPS". 4. 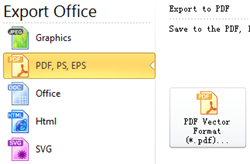 Choose PDF Vector Format to export Edraw diagram to editable PDF file.